Sidney Crosby scored twice, including his 400th career goal, and the Pittsburgh Penguins pulled away from the St. Louis Blues for a 4-1 victory on Sunday. 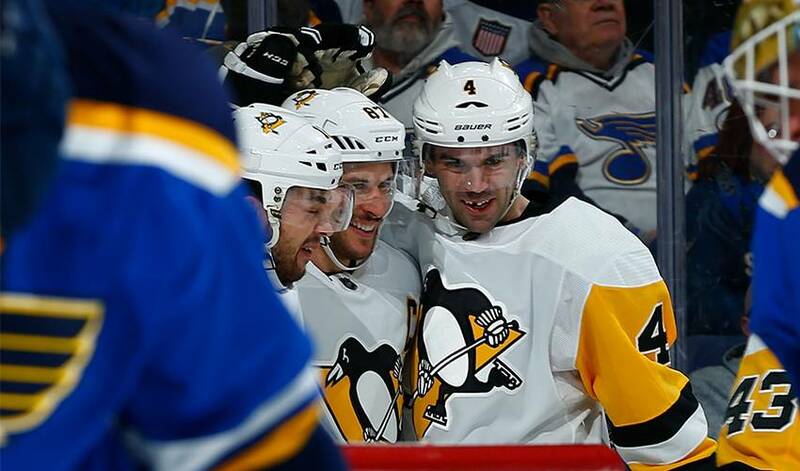 ST. LOUIS — Sidney Crosby scored twice, including his 400th career goal, and the Pittsburgh Penguins pulled away from the St. Louis Blues for a 4-1 victory on Sunday. Bryan Rust snapped a tie with a third-period tally and Riley Sheahan also scored for the Penguins, who have won 12 of 17. Matt Murray made 33 saves. Kyle Brodziak scored for St. Louis, which had won two in a row. Jake Allen had 19 stops. Crosby had not scored in his previous 10 games dating to Jan. 14. The captain stopped the drought in the second period in front of his father Troy, who was on the two-game dads' trip that began Friday in Dallas. Crosby added an empty-netter with 2:48 left for his 19th goal of the season. LAS VEGAS (AP) — Sean Couturier had a goal and two assists to help Philadelphia become just the fourth team to beat Vegas at home in regulation this season. Andrew Macdonald, Claude Giroux and Radko Gudas also scored for Philadelphia, which improved to 20-8-2 since Dec. 4 — when it ended a 10-game winless streak with a 5-2 victory at Calgary. One night after coming off the bench to stop five shootout attempts and help the Flyers to a 4-3 win in Arizona, goalie Michal Neuvirth stopped 14 shots to improve to 7-7-2 on the year. Brayden McNabb scored the lone goal for Vegas, which is 19-4-2 at home this season. Marc-Andre Fleury, now 27-18-2 lifetime versus Philadelphia, finished with 38 saves. NEWARK, N.J. (AP) — Adam McQuaid got his first goal of the season with 8:05 to play, and Boston extended its road point-scoring streak to 13 games. Fellow defenceman Torey Krug scored twice and Tim Schaller also scored as the Bruins improved to 19-2-4 in their last 25 games. Patrice Bergeron added an empty-netter, and Anton Khudobin finished with 35 saves. Miles Wood, Taylor Hall and Kyle Palmieri scored for the Devils, who have lost four straight and eight of 11. Eddie Lack, who was acquired in a trade with Calgary in late December, made 22 saves in his first start for New Jersey. ANAHEIM, Calif. (AP) — Logan Couture had a goal and an assist and then scored in the shootout to help San Jose beat Anaheim. San Jose's Timo Meier tied it with 53.7 seconds remaining. Martin Jones made 25 saves in the Sharks' second straight win. San Jose remained in second place in the Pacific Division, two points ahead of Calgary — which won at the New York Islanders. Anaheim is tied with Los Angeles in fourth, one point behind the Flames. WASHINGTON (AP) — Tomas Tatar scored his second goal of the game 2:47 into overtime, helping Detroit avoid a second straight embarrassing loss. Justin Abdelkader, Luke Glendening and Anthony Mantha also scored for the Red Wings, who had dropped three in a row. They blew a 5-2 third-period lead against the New York Islanders on Friday and lost 7-6 in overtime. Jimmy Howard made 23 saves in his first win since Jan. 5. Alex Ovechkin scored his NHL-best 33rd goal for Washington, which was coming off a home-and-home sweep of Columbus. Brett Connolly, Dmitry Orlov and Nicklas Backstrom scored in the third, and Holtby stopped 24 shots. BUFFALO, N.Y. (AP) — Tyson Jost and Gabriel Bourque scored rebound goals in the third period, and Colorado held on for the win. Colin Wilson had a goal and an assist, and Alexander Kerfoot and Matt Nieto also scored in a game the Avalanche never trailed. Jonathan Bernier stopped 28 shots. Ryan O'Reilly and Evander Kane scored in the final 7:46 after Buffalo fell behind 5-2. O'Reilly added two assists, Casey Nelson and Benoit Pouliot scored short-handed goals and Robin Lehner stopped 22 shots for Buffalo. The Sabres played without leading scorer Jack Eichel, who will miss four to six weeks with a sprained right ankle. Eichel was hurt in a 4-2 win at Boston a day earlier. NEW YORK (AP) — Calgary's Matthew Tkachuk scored twice in the third period, getting the tiebreaking goal with 1:05 left. Mark Jankowski also scored for the Flames, who pulled into a tie with Minnesota for the second wild card in the Western Conference. Mike Smith made 23 saves before leaving due to an injury with 2 seconds remaining, and David Rittich came on to close the game. Travis Hamonic had an assist on Tkachuk's late goal in his first game back in Brooklyn since the Islanders dealt him to Calgary in the off-season. Casey Cizikas and Anthony Beauvillier scored for the Islanders, and Jaroslav Halak finished with 39 saves. WINNIPEG, Manitoba (AP) — Jimmy Vesey scored with 3:53 left in the third period, sending the Rangers to the win. Vesey returned to the lineup after missing three games with a concussion and picked up his 11th of season when he deflected Brady Skjei's shot after it hit a Jets player. It looked as if Dustin Byfuglien tied it for Winnipeg with 1:22 remaining, but his goal was called off because of teammate Mark Scheifele's high stick. Michael Grabner then scored an empty-net goal for New York with 43 seconds left. Henrik Lundqvist stopped 37 shots for the Rangers in the opener of a four-game trip. Mats Zuccarello ended a 21-game drought with his ninth goal. Nikolaj Ehlers scored his 21st goal for Winnipeg, and Connor Hellebuyck made 25 saves. DALLAS (AP) — Reid Boucher scored his first two goals of the season and Jacob Markstrom made 30 saves for his second career shutout, leading the Canucks to the runaway road win. Vancouver opened a 3-0 lead in the first 13:27. Boucher and Jake Virtanen scored unassisted, and Thomas Vanek added the third goal. Bo Horvat scored on the power play, and Boucher connected on a tip-in in the second period. Erik Gudbranson had a third-period goal. Dallas had won five in a row. The loss prevented the Stars from passing St. Louis for third place in the Central Division. Dallas' Kari Lehtonen had 19 saves after replacing Ben Bishop following Horvat's goal. Bishop allowed four goals in 20 shots.